the Hilversum International School for their 2014 CAS trip! 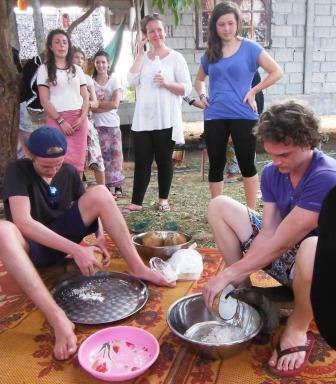 The focus of their time was to experience Thai culture and lend a helping hand to the Burmese Learning Center. 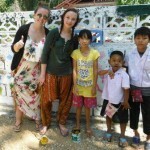 The trip began with a village homestay in Ban Tale Nok where the group was welcomed by the friendly and smiling families. The students learned about Thai Muslim culture through participating in activities like: cooking a Thai snack, net fishing at sunset on the beach and weaving roof panels made out of Nippa Palm Leaves and discussion on Islam in Thailand. One day the students hopped on a longtail boat for a trip out to the Gam Islands only 10 km from the village for snorkeling and a picnic lunch in the undeveloped surroundings. 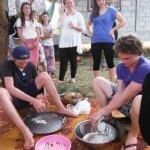 The time spent allowed for cross cultural exchange between the village and the students! 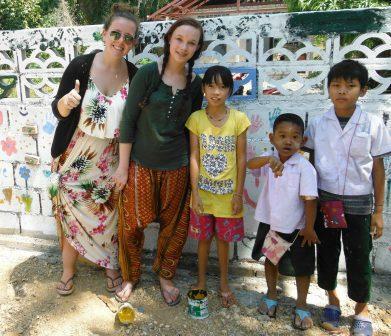 The Hilversum group CAS activities took place at the Burmese Learning Center in Kuraburi. This small center provides education to 50 Burmese children who otherwise do not have access to the Thai school system. Here the Dutch students with the help of the BLC students and staff created a recycle bank, painted the kitchen building, and made murals on the window coverings. The Burmese Learning Center continues to develop into a healthy learning environment with the help of groups like Hilversum! The final service work was held at Home and Life Foundation, which provides for 25 children whose families are unable to care for them. The group assisted with projects that help with the organic garden, river bank retention and hydroponics garden! The nights were spent camping at the beautiful Tai Mueang National Park. The trip gave the Hilversum students a well-rounded view of Thailand and the beauty it has to offer. “I learned so much about the culture and country of Thailand. I met the most amazing people at the homestay and Burmese Learning Center, it was an unforgettable experience. We are an IB school in HK. Every year, we will organize CAS tour to my students in Asia. Originally we have a tour to Bali and do some services there. But due to the increasing student’s population, we need to develop one more tour for my students. Our target is Thailand, looks for something environmentally friendly tour, ecotour, or sustainable tour, involving culture discovery, people with people interaction and services program. We expect, in the coming year, we have at least 25 students demand for this type of CAS tour. Can I have more information about your tour in Thailand. Thank you for your interest in Andaman Discoveries and the communities we serve.